Who was the smallest man to win a heavyweight title? Sports fans sometimes wonder who was the smallest man to win the heavyweight championship of the world. It was Tommy Burns born Noah Brusso in 1881 in Chesely Ontario.He was only 5'7 and for most of his career weighed about 160 pounds, 11st 6lbs middleweight. After winning the title in a 20 rounder from Marvin Hart in 1906, little Tommy, a hard puncher defended his crown 11 times within a couple of years traveling the world to do so. He knocked out ten opponents including Ireland's Jem Roche on St. Patrick's Day 1908 in Dublin-the only time the heavyweight title was fought for in Ireland, and the first round knockout is regarded as the shortest heavyweight title fight in history. Burns made more history when he fought Jack Johnson on December 20, 1908 in Australia-the first time a coloured man was allowed to contest the title. Johnson was 6'2 and weighed 210 pounds. He toyed with the smaller man and knocked him out in round fourteen.after a few more bouts Tommy retired and became a preacher. 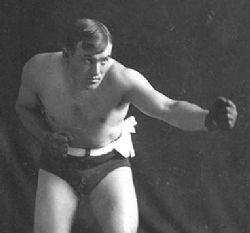 The second smallest heavyweight champion was Bob Fitzsimmons, who was 5'11 and again rarely weighed over 11stone 6lbs.During his 30 years in the ring he won the Middleweight title from the Nonpareil Jack Dempsey and he shocked the world knocking out the current champion at the time James J.Corbett again on St. Patrick's Day, Carson City, Nevada. Finally at the age of forty, Fitz won the newly created Light Heavyweight title in a 20 round decision against George Gardner on March 25 1903. A highly skilled boxer, broad shoulders Fitz was a deadly hitter, two of his opponents dying after being knocked out by him. The Third smallest heavyweight king was Rocky Marciano who was actually about 5'9 tall and fought at the top weight of 185 lbs.The Rock had 49 fights winning 43 by Knock out and winning the other six by decision. One of these was over the previously undefeated Roland La Starza who he had out pointed in 10 rounds in 1950.Then in a rematch after Rocky won the title he knocked out La Starza cold in New York in September 1952. A second points verdict was over former world champion Ezzard Charles who lasted the fight but took a beating on June 17 1954. Exactly three months later Marciano knocked out Charles in eight rounds. Another fighter who was not a big man physically but one of the most famous fighters of all times was Jack Dempsey-The Manassa Mauler.Dempsey was born June 24, 1895, he had 78 bouts, not counting exhibitions, 26 of his fights ended in the first round. Due to poor judgement by his older brother, his manager, Jack lost just one fight on a stoppage. On February 13 1917, Dempsey met Fireman Jim Flynn (born Andrew Chiariglione)in round one Flynn floored Jack before Jack could regain his feet his brother threw in the towel stopping the fight. Flynn and Jack had a rematch on February 14 1919, again in round one Dempsey flew across the ring at Flynn and knocked him out stone cold within a minute. Dempsey had more one round knock outs than any other Heavyweight Champion.He won the title on July 4 1919 knocking out 6"6 Jess Willlard who was six inches taller and nearly 4 and a half stone heavier. When the bell rang for the first round Dempsey flew at Willard Knocking him down, mercilessly beating him and breaking some facial bones. Doc Kearns, Dempseys manager had bet a lot of money on his man, that Jack would win in the first round, and as Willard was down when the round ended, thought they had won. Dempsey was in fact out of the ring when the referee called him back. The carnage continued into the second round and the fight ended when Willlard was unable to start round three. Dempsey was a hair over 6 feet tall and again his top weight all his life was 185 lbs, he never carried an ounce of fat on him and enjoyed all his faculties until his death at his New York home on May 31 1983, almost 88 years of age.